Hello! Welcome to our website! Thank you for visiting the page and supporting our artwork! Here is a little bit more about who we are! Born and raised in the San Fernando Valley, Javier was always creative. He is a self-taught artist and developed his craft in three dimensional sculpture work. He then started his professional career in the entertainment industry with the company, Gentle Giant, doing special effects and make-up for various films such as the “Pirates of the Caribbean” films, Tim Burton’s “Alice in Wonderland,” and much more. He worked as a Sculptor and Prototype Illustrator, as well as assisted with digital scans, working closely with celebrities and artists. Javier also worked for Daniel’s Woodland as Creative Director where he made fantastical wood sculptures and imaginative tree houses. He then immersed himself in the theme park world, working for Garner Holt Productions as a Senior Creative in Dimension, bringing animatronic figurines to life. With a passion for storytelling, Javier is now living the dream as a Senior Production Artisan for Disney. He is excited to embark on ghoulish new adventures with his art and is dying to meet you. From a young age, Johana knew that she was born to be an artist! She was born in Brooklyn, but quickly realized the big city wasn’t big enough for her. Her family left Brooklyn when she was only a year old and moved to Central America. Three years later, they moved back to the United States, but this time, to the City of Angels. In Kindergarten, Johana developed her love of arts of craft from her teacher who inspired her. She was influenced by the storytelling and art of Peter Rabbit by Beatrix Potter. In junior high, various music artists such as Bjork, Janis Joplin and Lauren Hill also had an impact on her artwork because they were strong, independent women who were not afraid to express themselves. She then went to LA Valley Community College for chalk life drawing and Brooks College for fashion design. Along with schooling, she was mostly self-taught with her natural God-given talents for design and creativity. She focuses on chalks, fabrics, knitting, crocheting, jewelry, and creating themed shadow boxes! 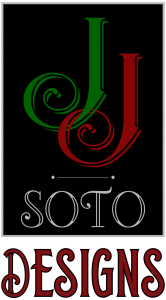 She enjoys developing her own artwork as well as being the better half of the dynamic duo, JJSotoDesigns. Comic Con Palm Springs 2018!